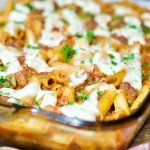 This gluten free baked ziti is so flavorful that you might like it even better than the "real thing!" Can be made dairy free too! Sauté onions and peppers over medium heat with a tablespoon of cooking oil or light coating of cooking spray. When veggies begin to soften, add Italian sausage and cook until it begins to brown. Add can of tomatoes, spaghetti sauce, parmesan cheese, vinegar (may use regular balsamic alone if you don't have golden balsamic available), garlic powder. Cook for about 20 minutes, stirring occasionally. Meanwhile, prepare the pasta separately, according to directions on package. Remove from heat about 3 minutes before the packages says (you want pasta to be slightly underdone). Drain pasta, then add to a large mixing bowl with the meat sauce. Stir together until pasta is well incorporated in sauce. Pour everything into a large baking dish and layer with 6-8 slices of mozzarella cheese. (We used lactose-free veggie cheese). Broil for 5-7 minutes until cheese begins to melt. If using veggie cheese, it may not melt as much as regular cheese, but it should soften. Remove dish from oven and sprinkle with chopped fresh basil.